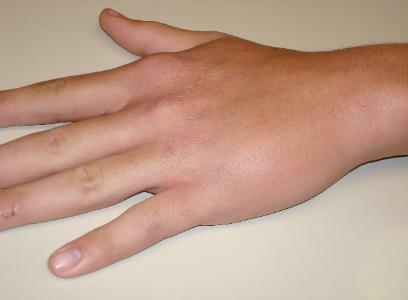 One of the more common types of fractures seen in the hand, a boxer's fracture typically occurs when an individual punches a hard object such as a wall. The impact of the punch is absorbed into the 4th and 5th metacarpal bones of the hand just below the 4th and 5th metacarpophalangeal joints. Because the 4th and 5th metacarpal bones are smaller in diameter than the other metacarpal bones in the hand, they are more susceptible to injury. If the force of the punch is stronger than the strength of the bones to absorb the force, the bones will break. These fractures are often angulated, and if severely so, require pins to be put in place and realignment as well as the usual splinting. However, the prognosis on these fractures is generally good, with total healing time not exceeding 12 weeks. The first two weeks will show significantly reduced overall swelling with improvement in clenching ability showing up first. Ability to extend the fingers in all directions appears to improve more slowly. Hard casts are rarely required and soft casts or splints can be removed for brief periods of time. Removal allows for activities such as showers and "airing out" the cast or splinted area so as to avoid skin rotting and permits cleansing of the cast or splinted area. Pain from this injury is generally very mild and rarely requires medications beyond over the counter drugs such as ibuprofen or acetaminophen.